'The Troubles' in Ireland are well know, conflict between two demographics (Catholic and Protestant) that share the same religous root: Christianity. Its been going on since Cromwell. But a lesser known fact is that two Irish mums won the 1976 Nobel Peace Prize for beginning a Peace Movement in Northern Ireland to combat the carnage. 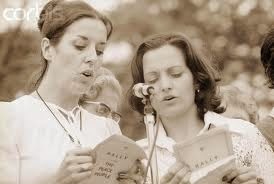 To quote the Nobel Committee in 1976: We admire Betty Williams and Mairead Corrigan for tackling so fearlessly the perilous task of leading the way into no-man's land, in the cause of peace and reconciliation. "That first week will always be remembered of course for something else besides the birth of the Peace People. For those most closely involved, the most powerful memory of that week was the death of a young republican and the deaths of three children struck by the dead man's car. A deep sense of frustration at the mindless stupidity of the continuing violence was already evident before the tragic events of that sunny afternoon of August 10, 1976. But the deaths of those four young people in one terrible moment of violence caused that frustration to explode, and create the possibility of a real peace movement...As far as we are concerned, every single death in the last eight years, and every death in every war that was ever fought represents life needlessly wasted, a mother's labour spurned."